After being invited to his first kissing party, 12-year-old Max (Room's Jacob Tremblay) is panicking because he doesn't know how to kiss. 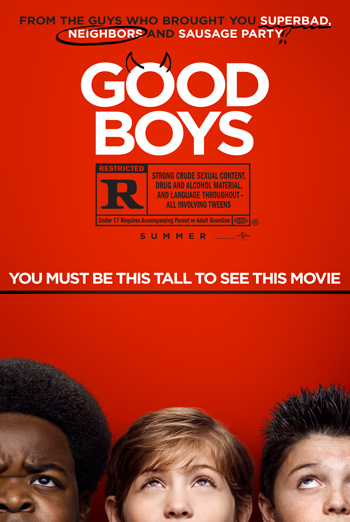 Eager for some pointers, Max and his best friends Thor (Brady Noon, HBO's Boardwalk Empire) and Lucas (Keith L. Williams, Fox's The Last Man On Earth) decide to use Max's dad's drone - which Max is forbidden to touch - to spy (they think) on a teenage couple making out next door. But when things go ridiculously wrong, the drone is destroyed. Desperate to replace it before Max's dad (Will Forte, The Last Man on Earth) gets home, the boys skip school and set off on an odyssey of epically bad decisions involving some accidentally stolen drugs, frat-house paintball, and running from both the cops and terrifying teenage girls (Life of the Party's Molly Gordon and Ocean's Eight's Midori Francis).